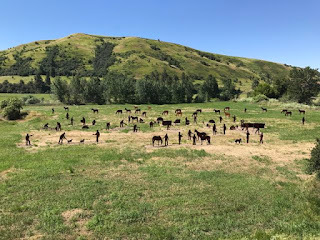 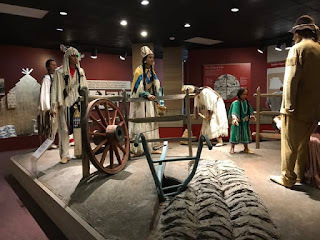 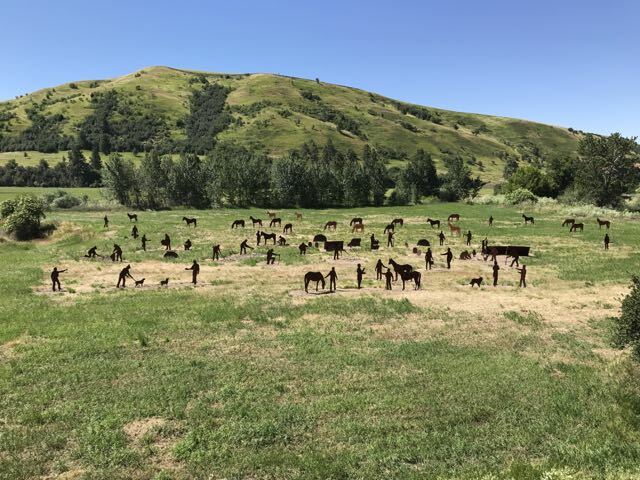 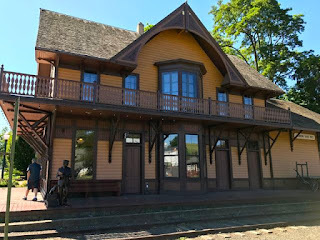 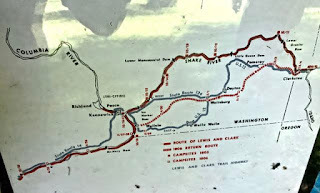 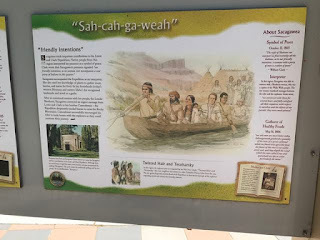 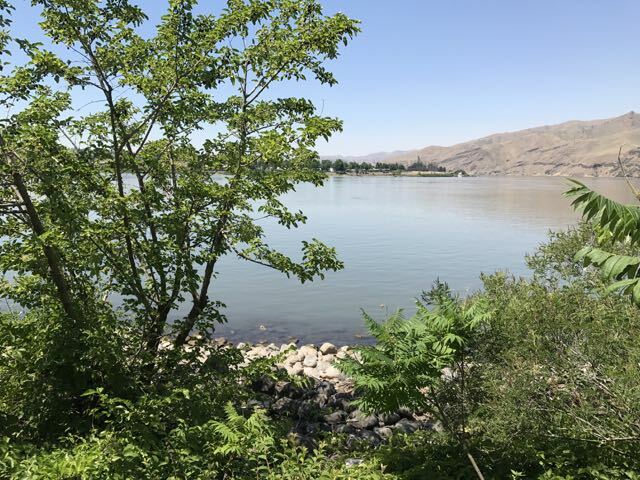 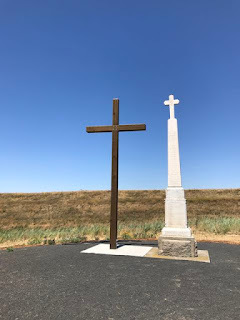 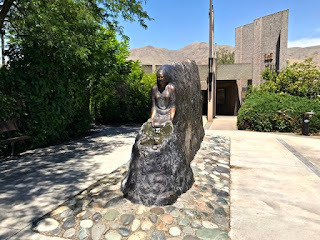 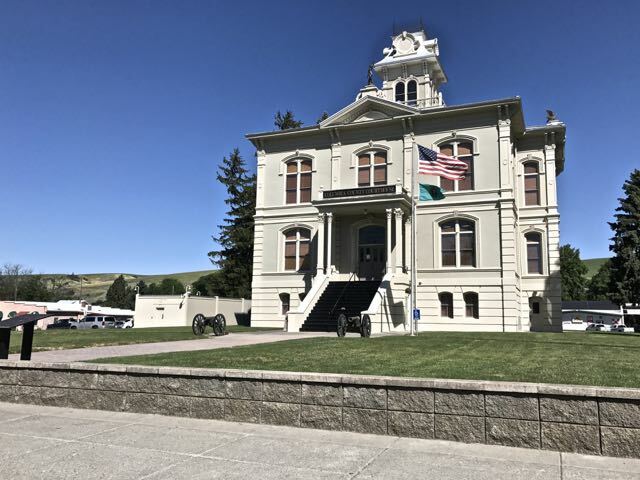 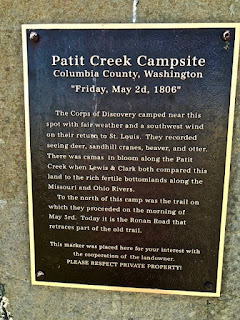 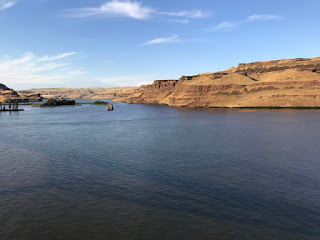 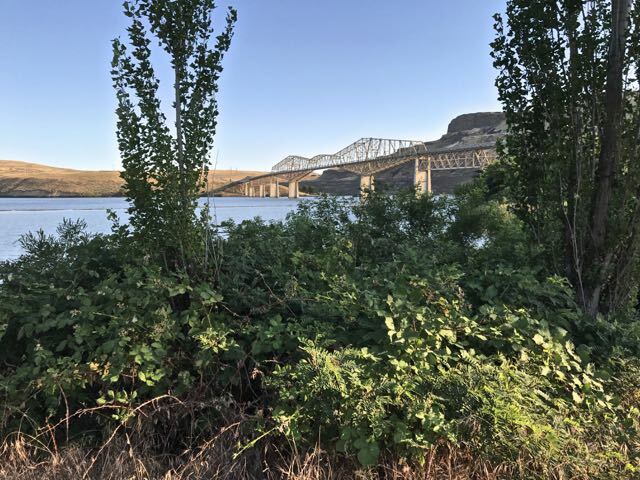 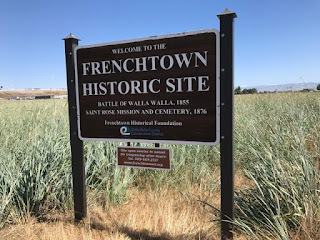 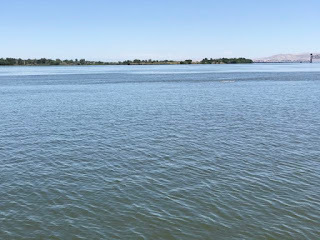 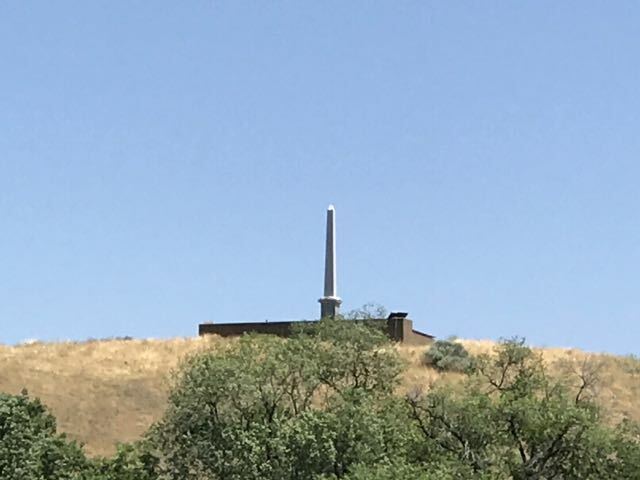 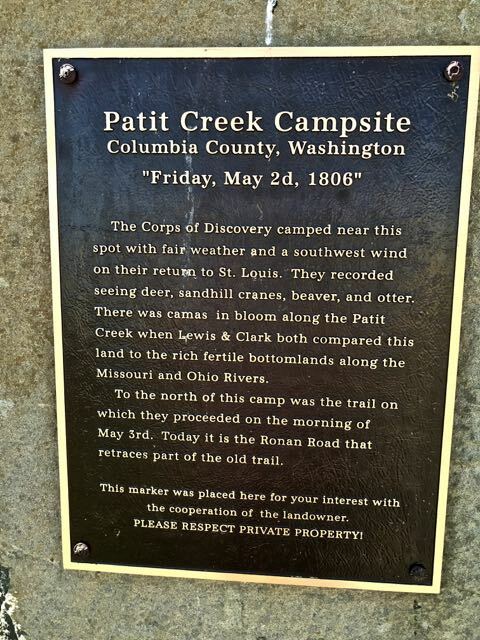 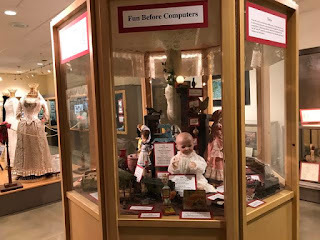 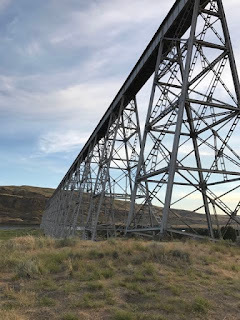 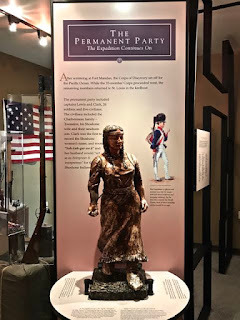 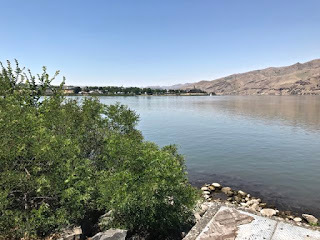 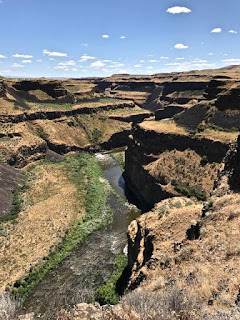 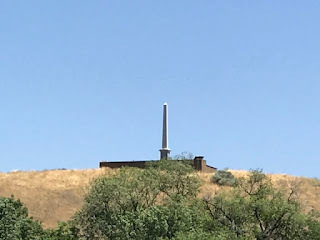 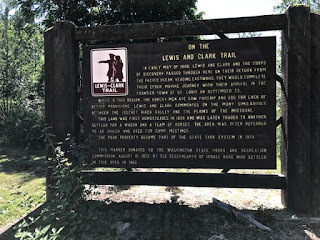 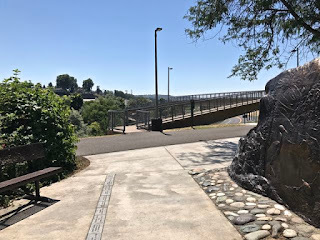 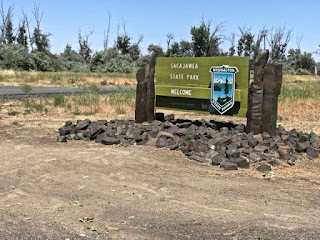 Our drive today took us to Pasco,WA via the towns of Dayton and Walla Walla with stops in Dayton to visit the Historic Railroad Station Museum, Petit Creek Campsite of Lewis and Clark, Lewis and Clark SP. 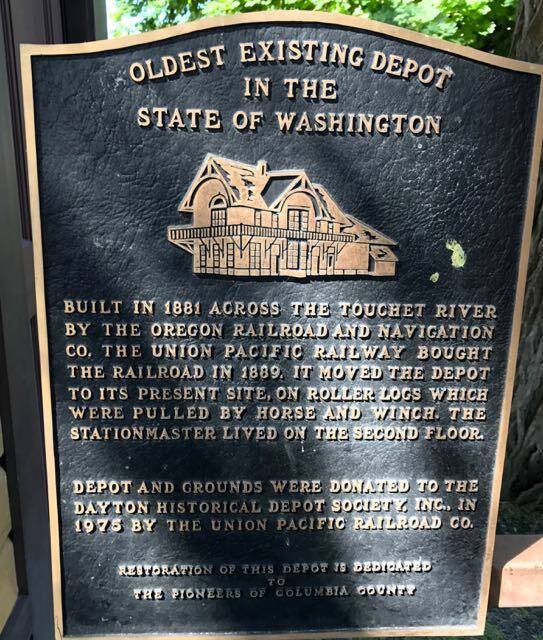 We were told that Dayton has more historic homes than Seattle. 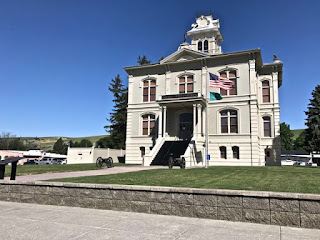 They, also, have a restored courthouse open for tours.Our time was limited for touring, but hope to return someday. Before the railroad in 1880's, farmers had to transport their grain overland to Walla Walla. 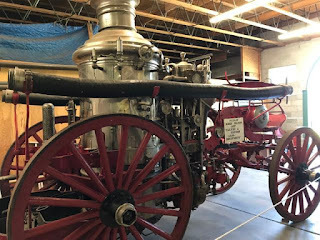 It was closed in 1972 and is now a museum. 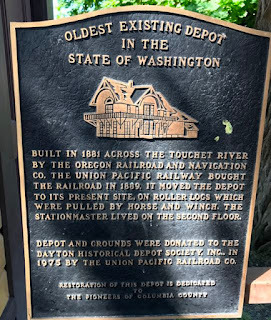 It is the oldest surviving rail station in the state of Washington. 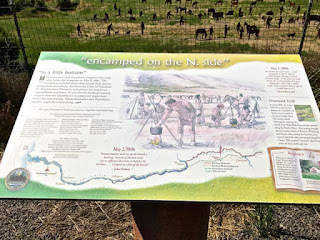 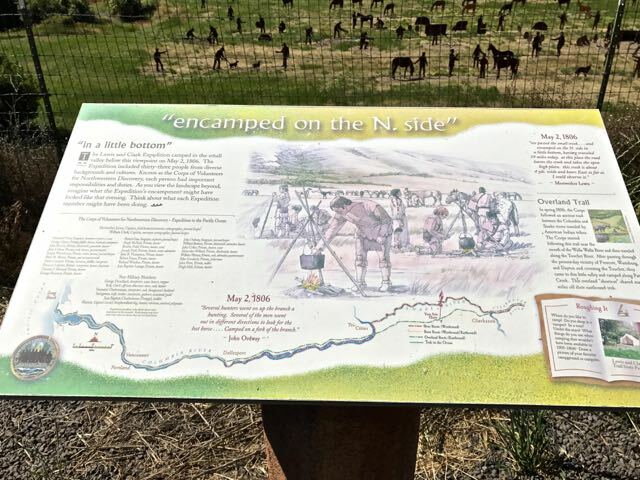 The Patit Creek Campsite has an amazing exhibit of over 80 detailed steel silhouettes depicting a typical campsite of the Corps of Discovry in 1806. 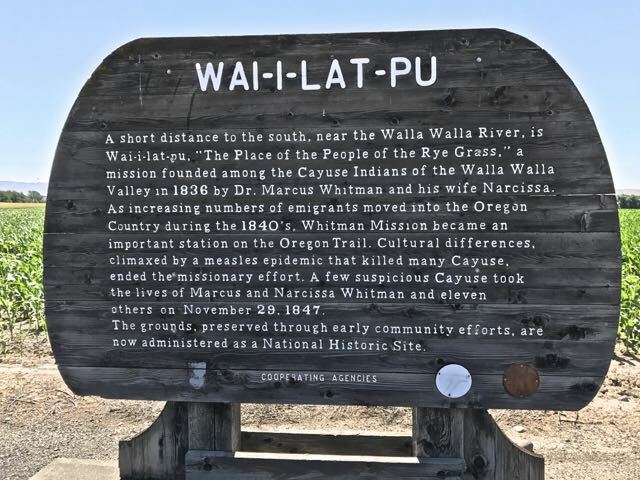 Prior to arriving here as they were camped near the confluence of the Walla Walla and Columbia rivers, Chief Yellepit of the Walla Wallas told the Explorers about a good overland trail that would save them many miles of dangerous up-river travel on the Snake which brought them to this location. Just down Hwy 12 is the Lewis and Clark SP with signage about their voyage. 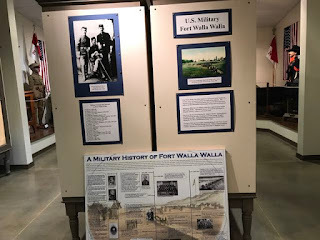 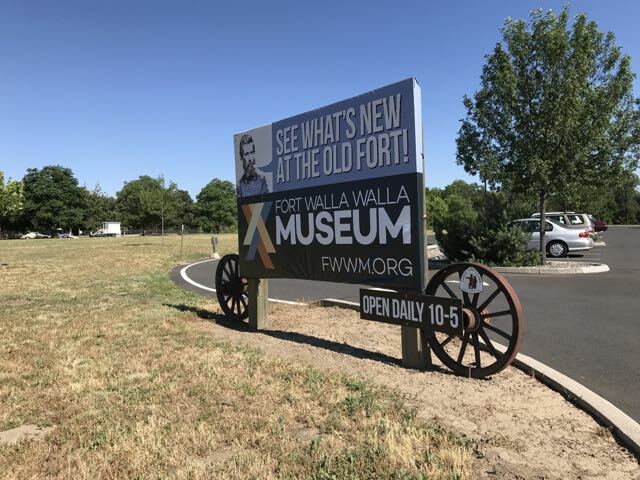 Continuing on to Walla Walla for stops at the Fort number 2 which is now a VA Hospital with the most of the Fort buildings being repurposed and not open to the public...only outside pictures allowed. 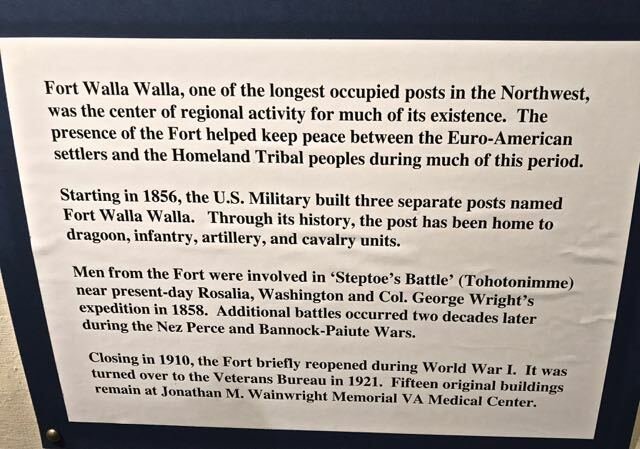 There were 3 Fort Walla Walls with the first one under the Columbia River. 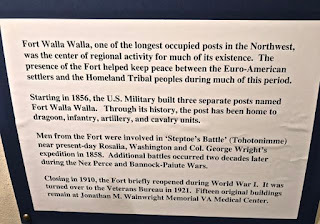 Fort two was located downtown and later moved to the VA grounds.We last visited here in May 2010. 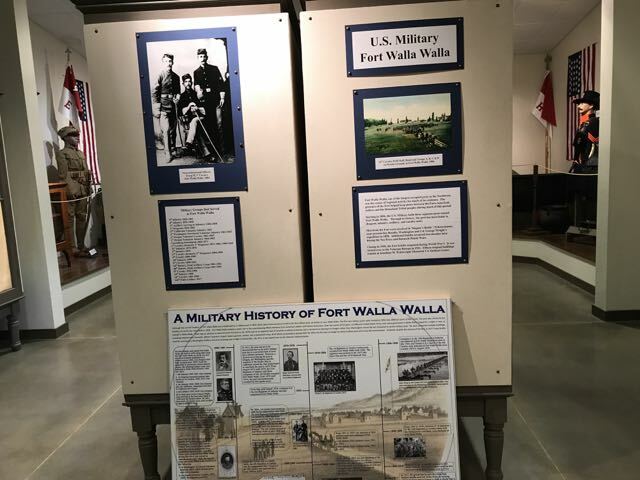 We also visited the Walla Walla Museum, Whitman Mission and Frenchtown Camp. 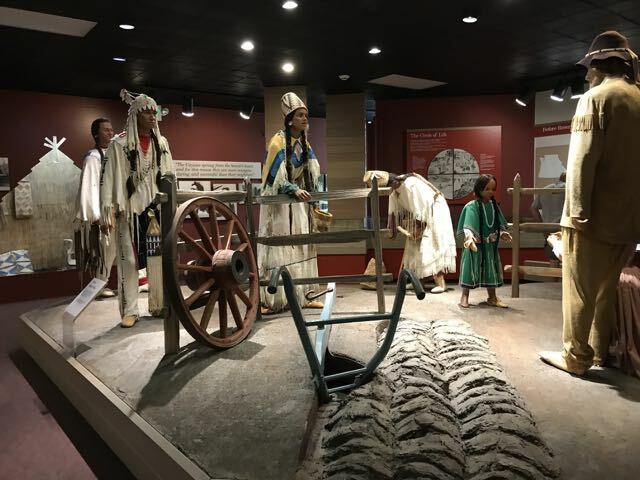 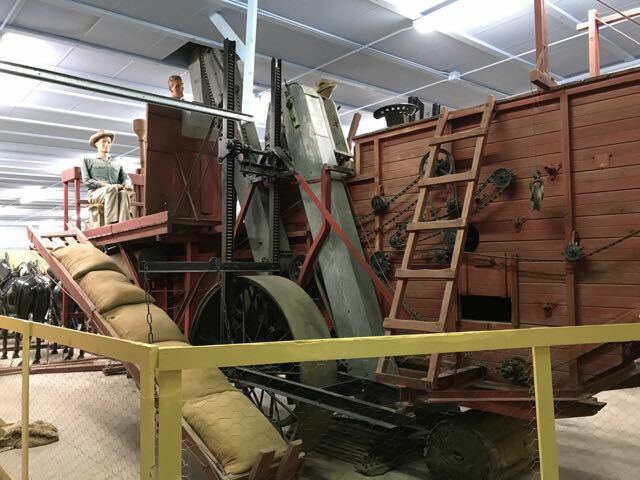 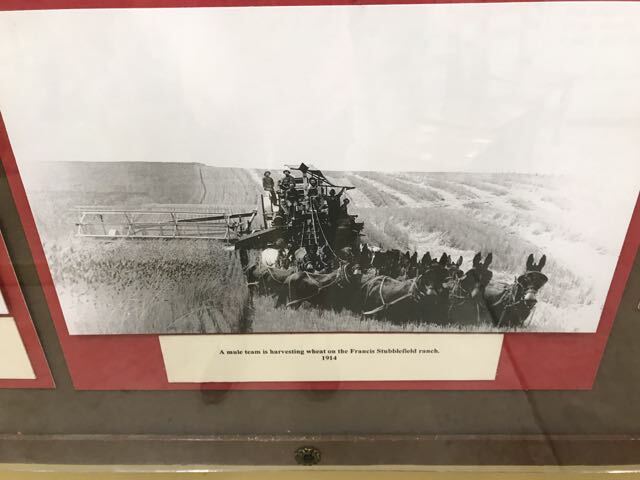 The Walla Walla Museum which features exhibits on pioneer history, Native Americans, largest collection of horse era agricultural equipment in the area and pioneer village. 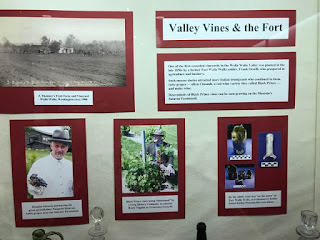 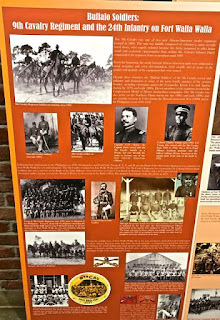 Below are just a few of the many exhibits. 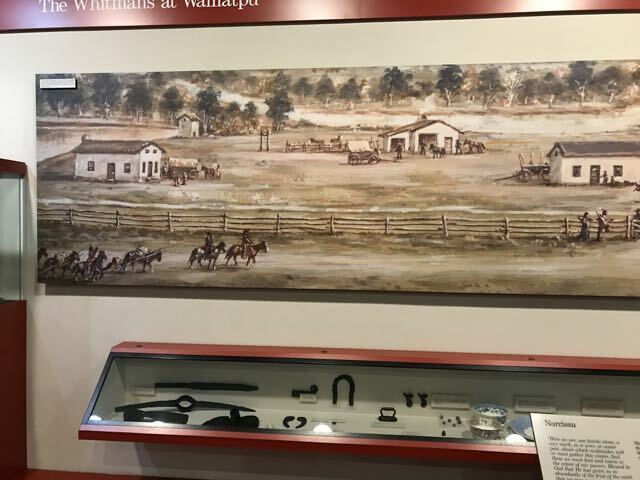 The Whitmn Mission which we also visited in 2010 has a sad story that ended in the massacre of the Whitman family and 13 others in 1847 as a result of a misunderstanding with the Cayuse. 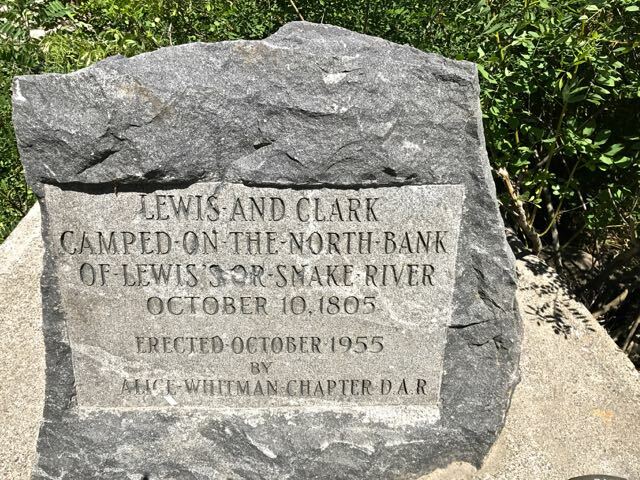 The relationship had been friendly until a measles outbreak took many lives of the Cayuse. 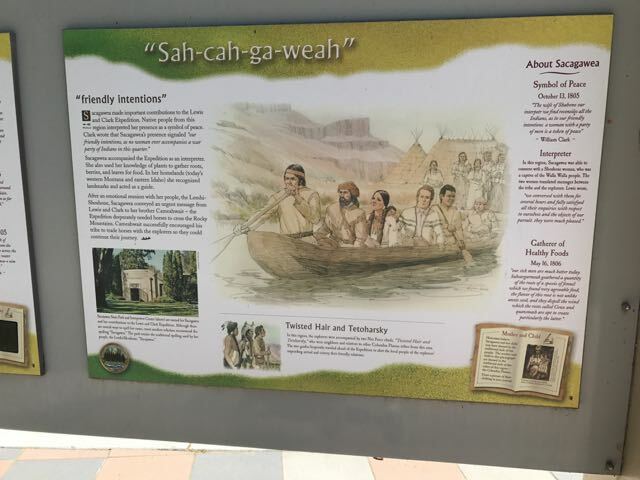 They felt the whiteman was poisoning them as the medicine helped the whiteman and not the Cayuse. This massacre ended the Protestant missions in the Oregon Territory and led to war. Near the Mission is the site of the Frenchtown Historic Site, home of the Walla Walla and Cayuse Tribes. 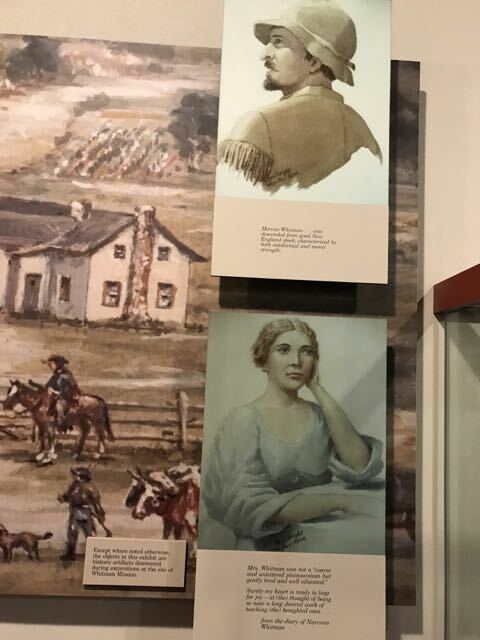 French Canadian voyageurs married into local tribes and settled here in 1823. It was here in 1855 that the Oregon Mounted Volunteers battled members of the Walla Walla, Cayuse, Palouse and Yakama tribes in what is known as the battle of Walla Walla. 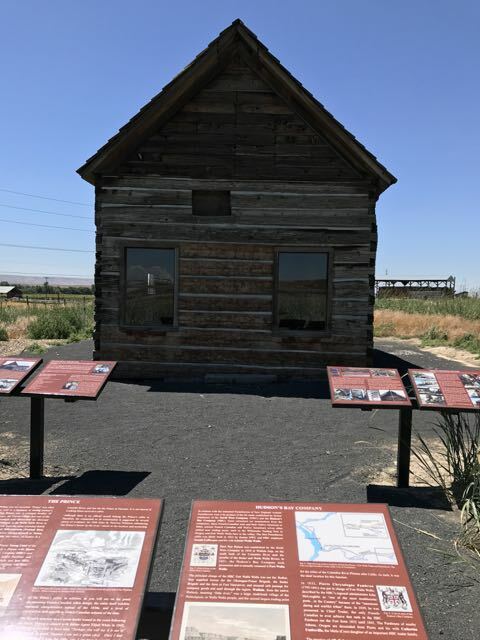 The restored Prince's Cabin built in 1837 by members of the HBC for a Cayuse man called Prince and St Rose Cemetery are located on the site. 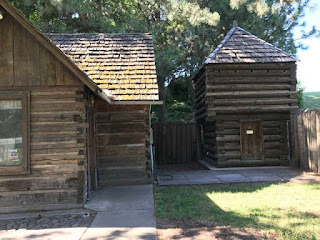 Our purpose for visiting Pasco was to tour the Sacajawea SP and Museum. 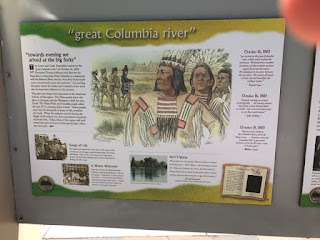 This is located at the confluence of the Snake and Columbia Rivers where the Corps of Discovery arrived 16 October 1805 and stayed for two nights on their way to the Pacific Coast. 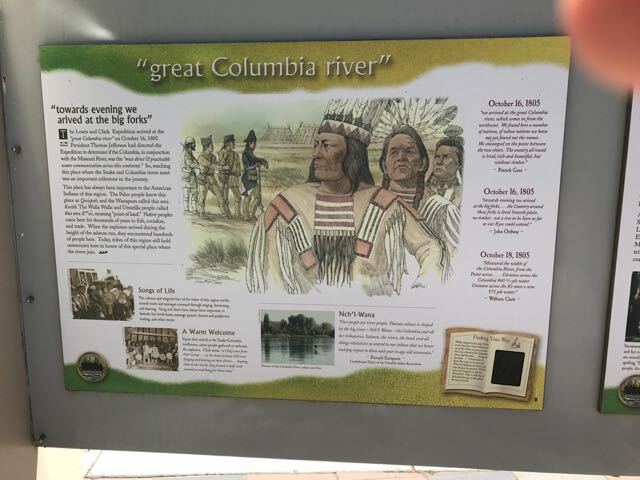 The site for years was a gathering place of many peoples and cultures for fishing and trading. 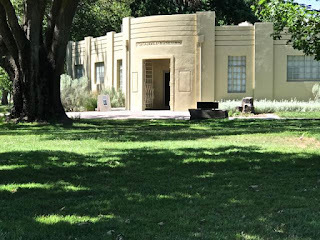 The Museum was constructed by the WPA in 1938. 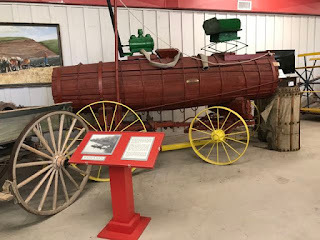 On our return trip we stopped in Dayton at "Firehouse Pizza" for dinner which was very good. 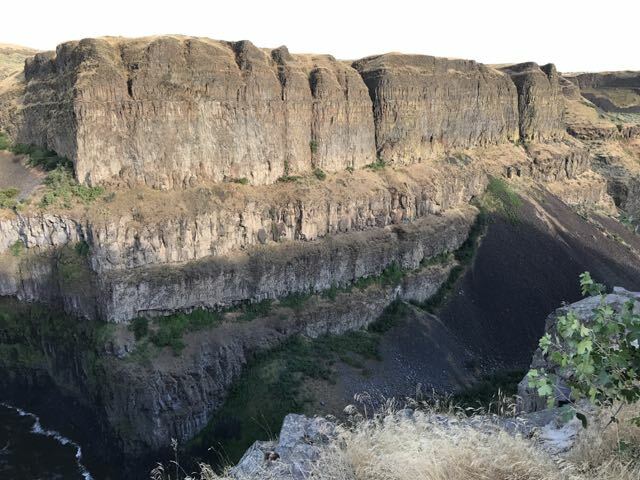 Took some slices home for lunch tomorrow. 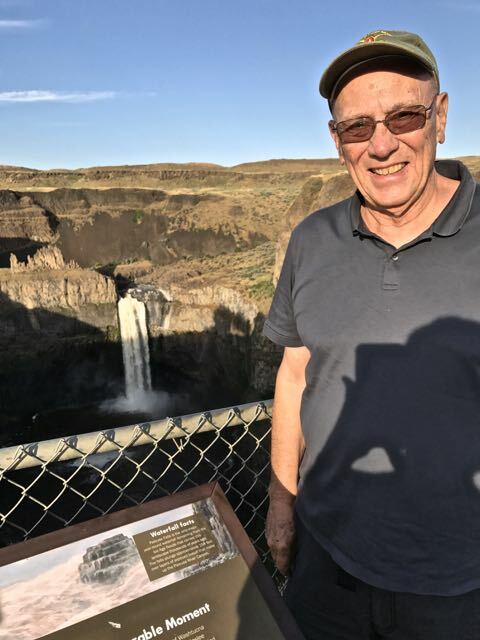 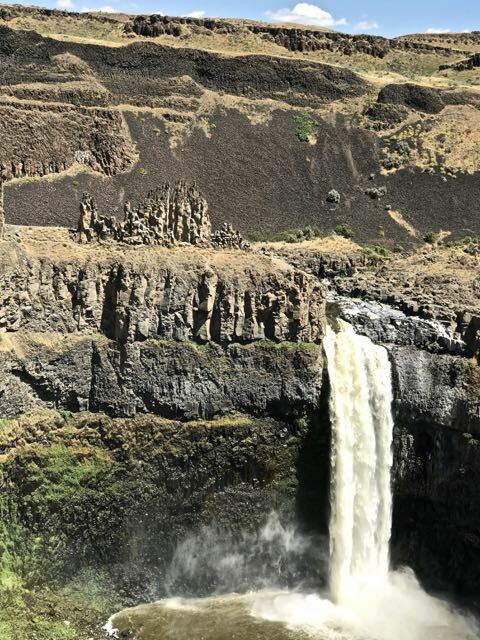 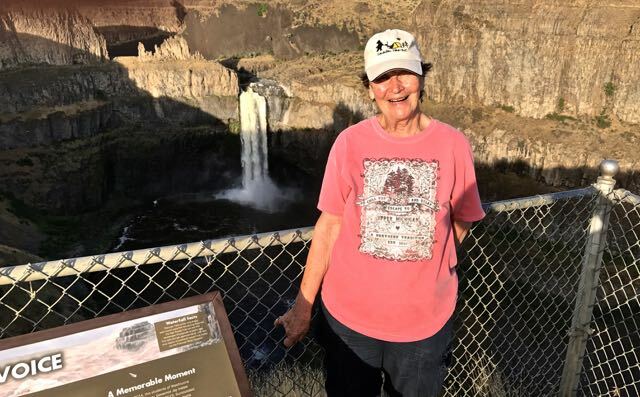 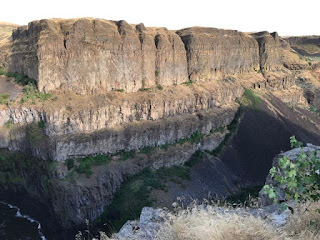 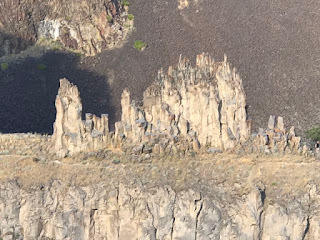 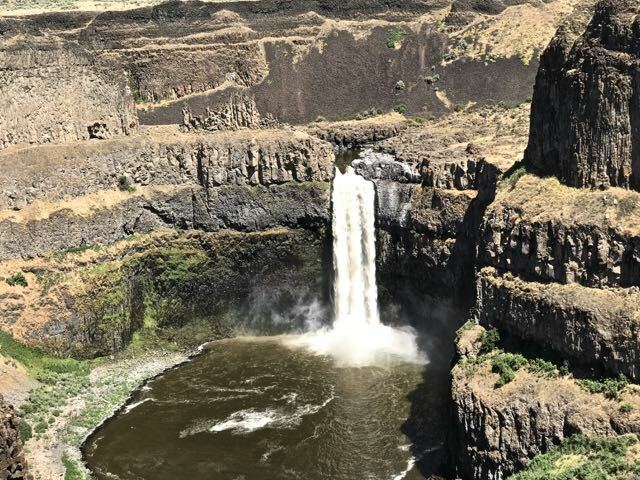 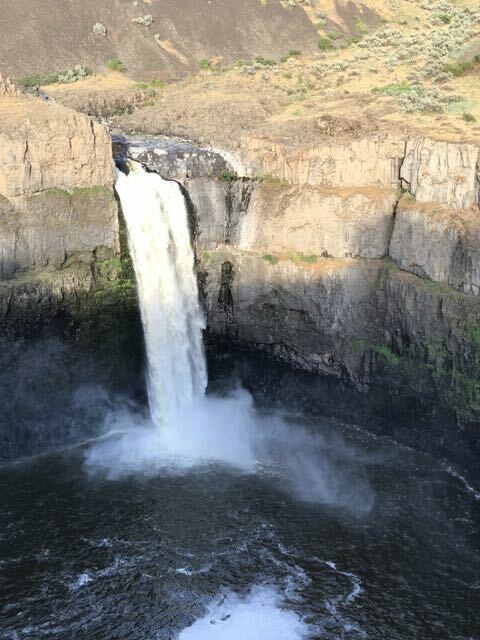 At the recommendation of the Visitor's Center, we tour a side tour to Palouse Falls on Hwy 261 off Hwy 12. 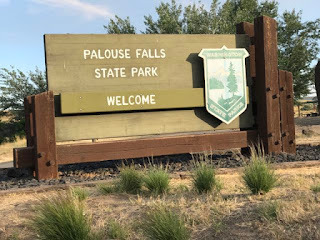 It is 20 miles to the Falls on a good road except for the last 2 miles which is rutted gravel, but well worth the drive. 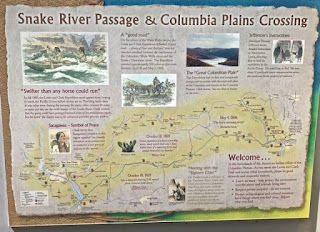 We also stopped at Lyons Ferry SP to view the confluence of the Palouse and Snake Rivers. 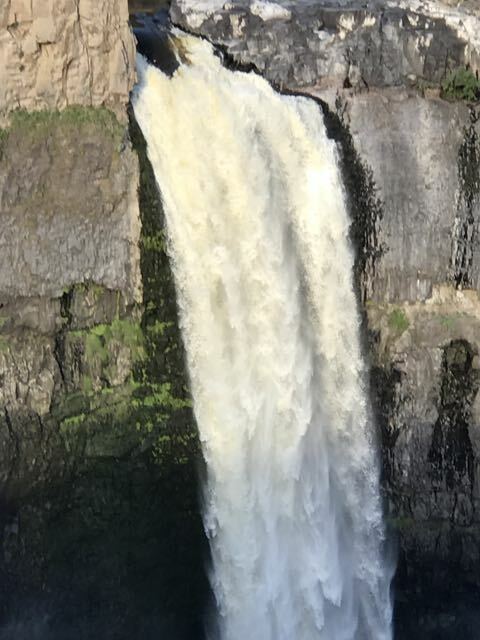 The Falls has been designated as the official waterfall of Washington State and is 198 ft in height. The Falls lie on the Palouse River, 4 miles upstream from the confluence with the Snake. Sad note: a 25yr man fell to his death in May hiking the outer rim.Last week a lightning strike caused a 500 acre fire in the park. 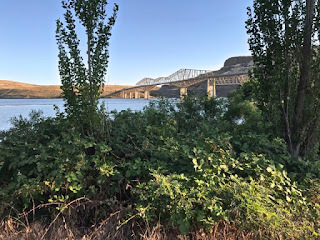 A stop at Lyons Ferry SP gave us a good view of the Palouse river, Bridge over Snake and Railroad Bridge. Another very hot 100 degree day, so we stayed close to campground except for 2 mile drive to the Confluence of the Snake and Clearwater display near downtown Lewiston. 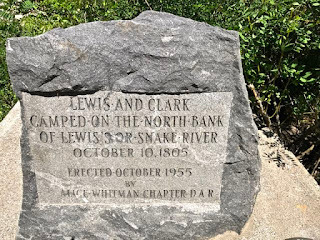 It was on the Snake River that Lewis and Clark made camp on October 1805. 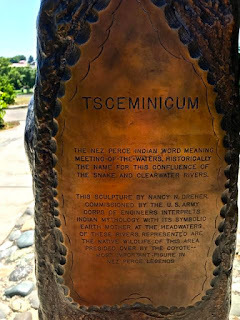 At that time the Snake was named Lewis.The Nez Perce word for the meeting of the rivers is Tsceminicum. 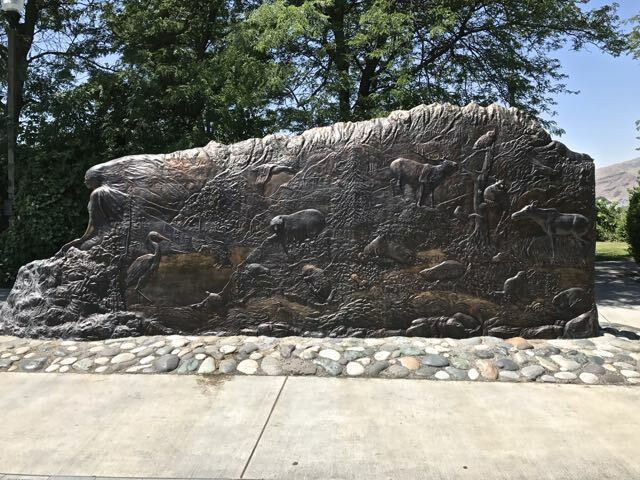 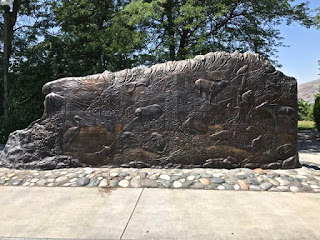 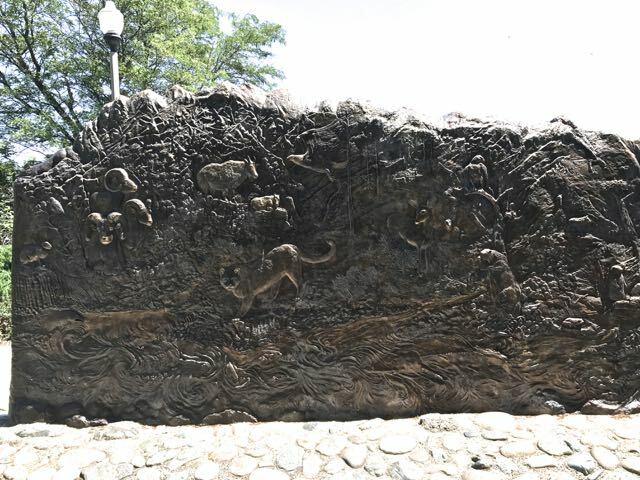 At the entrance to the display is a beautiful bronze sculpture by artist Nancy N. Dreher interpreting Indian mythology with its symbolic Earth Mother at the headwaters representing the native wildlife presided over by the coyote,the most important figure in Nez Perce legends. 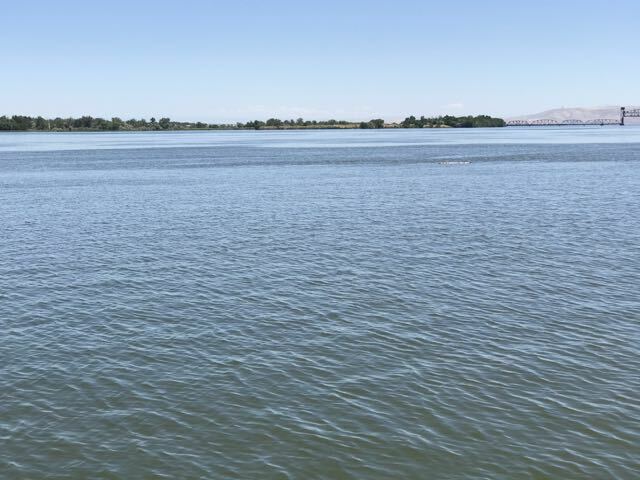 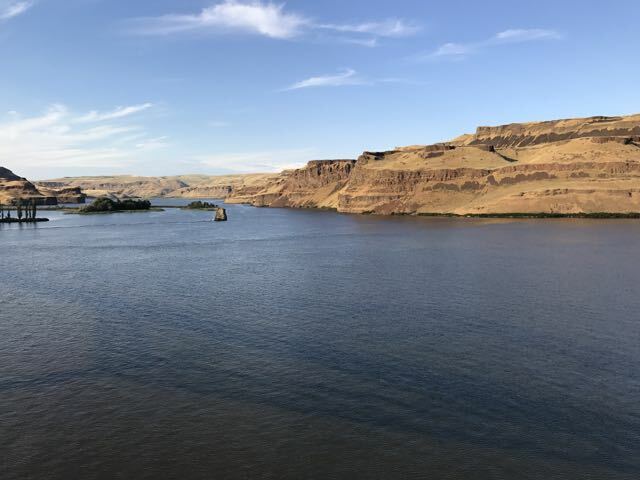 The Snake River is 1.078 miles long and the largest tributary of the Columbia River joining at Pasco ,WA.It rises in Wyoming, flows through southern Idaho, Oregon and Washington. 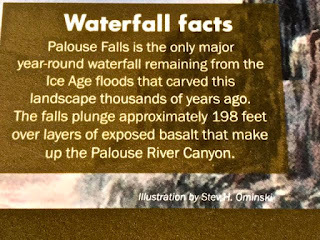 The river was created by a volcanic hotspot underneath Yellowstone NP. The Shoshones made a hand sign representing fish that was misinterpreted to represent a snake, thus the name Snake River. 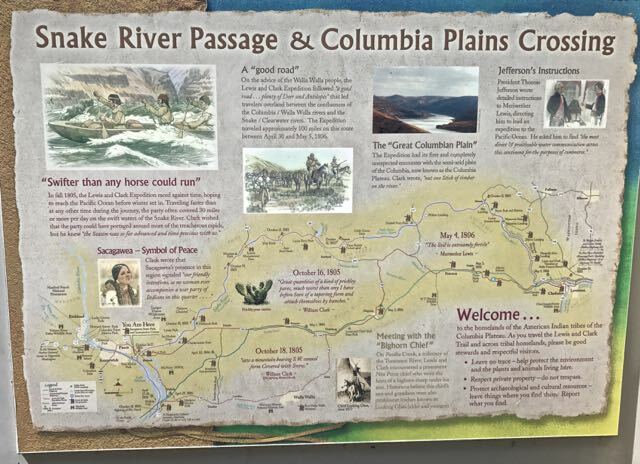 More than 11,000 years ago, Native Americans lived along and fished the River.Salmon from the Pacific Ocean spawned in the river. The Clearwater River is 75 miles long and flows from the Bitterroot Mountains along the Idaho and Montana border joining the Snake at Lewiston. This is the largest tributary of the Snake. 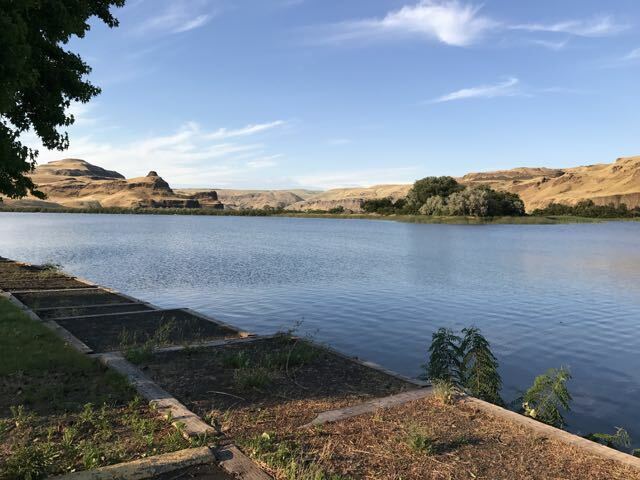 The Nez Perce named it Koos-K00s-Kai-Kai meaning "clear water". 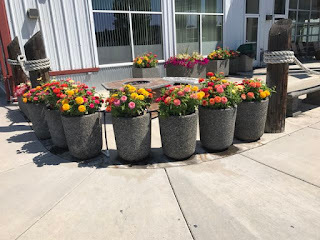 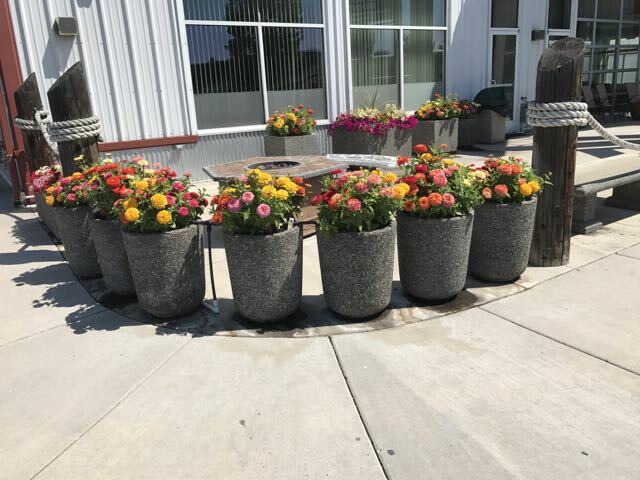 Below is flower display by office at campground.